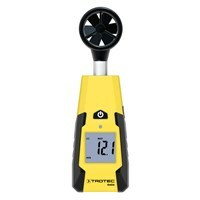 Professional hot wire anemometer from the MultiMeasure series. 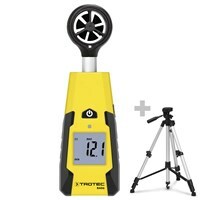 Precise measurement of air velocity, volumetric flow, air pressure and air temperature. The anemometer of the BA series serve as a helper for optimum air flow measurement in many different areas, such as sailing, surfing or to verify the performance of fans and ventilation systems. The devices of the BA series are suitable for simple flow rate measurement. In addition, the devices have been developed to 100% of Trotec and produced. 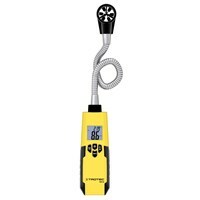 The professional hot-wire anemometer TA300 from the MultiMeasure series determines precise air speeds, temperatures and flow rates. The procedure may be especially practical telekopsonde to measurements on fans or ducts make the lie a little further away. The probe can be extended up to one meter. 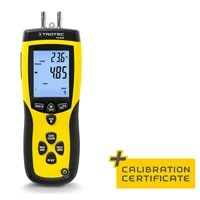 In addition, can the universal T3000 multifunction device using a anemometer sensor and a TC 30 connecting cable to convert to an airflow meter.